Feeding yourself on the tiny food stamp allowance is a scary prospect. I generally think of food as one of life's democratic, inexpensive pleasures, and Tiffany and I keep our overall food budget low by cooking simply with frugal but flavorful ingredients. But when we started to add up all the little things that made even the simplest-seeming menu sing, the cost added up fast! 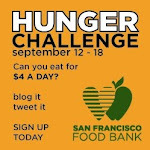 So Tiffany and I approached the idea of the Hunger Challenge with some firm principles in mind (Check out our menu/strategy post here.) Check out the sweet haul we brought back in the pictures above and throughout. And check out our shopping list after the jump! All of the prices here were determined on a "recon" trip to the Manila Oriental Market on Mission street in the Excelsior. It's a huge place with a dizzying array of mostly locally-grown Asian produce; aisles packed with imported sauces, condiments, spices, and delicacies; a 50-foot butcher counter featuring just about every part of the pig, chicken, and cow, as well as bits and bobs of more exotic beasts; and an equally large counter devoted to the fruits of the sea ranging from salmon heads (about $0.75/pound) to live spot prawns ($19.99/pound). Their health code score could stand some improvement, but it's still one of our favorite places to shop: cheaper than the Safeway a few blocks down and a lot more fun! Things at "Mom's", as we affectionately call the place, always seem cheap, but when I actually started looking at the prices closely and adding them up, it was still a real challenge to stay below $58 for the total. In the produce section, we discovered that even at the rock-bottom price of $0.59/pound, enough greens for a week got to be pretty expensive (those cabbages are way heavier than I thought!) We also had to cut out our fish for the week (at $3.99, the catfish was too expensive and Tiffany was not excited about salmon heads), trade down to some of the sketchier-looking brands for condiments and oils, and make our own dumplings rather than buy them frozen. But with some refining, we did get everything under the mark.